Our present ratings leave Republicans with 49 seats and Democrats with 47 seats, with four Toss-ups: Georgia and Louisiana, which both might be heading to overtime, and Colorado and Kansas, where incumbents Udall and Roberts are in deep trouble — especially Udall — but retain a path to victory. 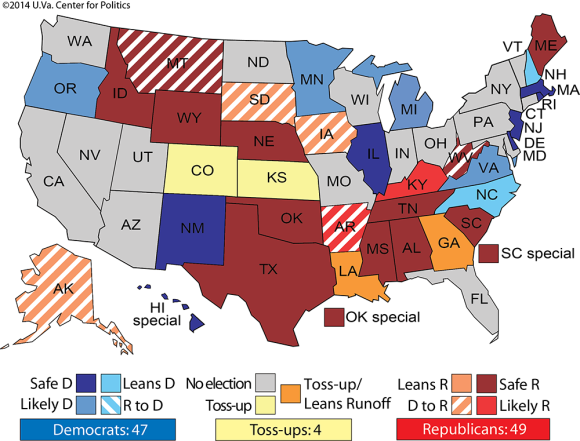 To claim a majority, Republicans need to win half of the Toss-up states. Democrats need to win three of them to achieve a Biden Majority (a 50-50 draw with Vice President Joe Biden’s tie-breaking vote giving Democrats the edge). Given the playing field, this arithmetic certainly advantages the GOP, but there is at least some chance that Democrats might pull off the unexpected.